Are some species of phytoplankton favoured by turbulent water? 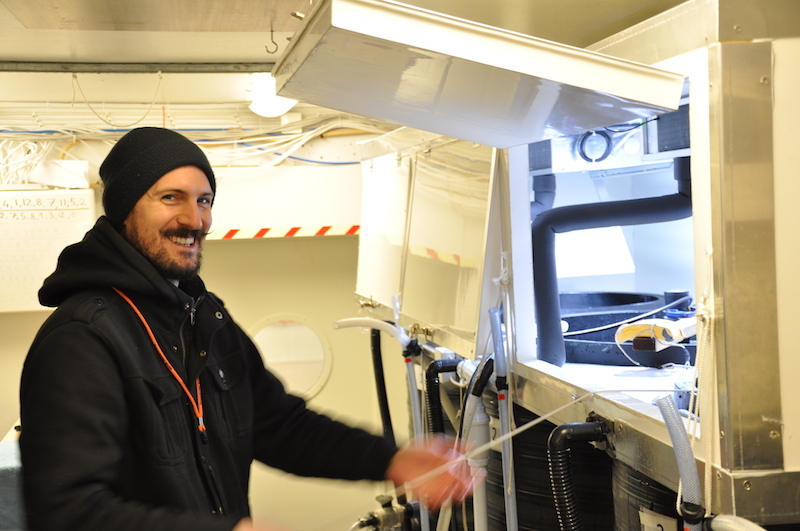 For two weeks, an international research team has utilized the mesocosm facility at Umeå Marine Sciences Center (UMF) to study how the movement of the water affects different species of phytoplankton. In Bath, England, the local authorities have problems with large algae blooms in drinking water reservoirs. Tests based on different stirring techniques has been adopted in order to solve the problem. The University of Bath has also initiated research on controlling mechanisms of algae bloom in order to find preventive water treatment techniques. The mesocosm facility at Umeå Marine Sciences Center consists of 12 five-meter high tanks, where the temperature and motion of the water can be controlled with high precision. The Bath team made use of the Transnational Access founding within the H2020 project Aquacosm. The project, entitled Phytomix, aimed to investigate how the shape of different species of phytoplankton influences their behaviour under different stirring regimes. Four scenarios were created within the mesocosms: strong stratification, weak stratification, weak turbulence and strong turbulence. The researchers identified the species of plankton that were present in the water at start, and how the amount of the different species changed over time due to turbulence or stratification in the water mass. 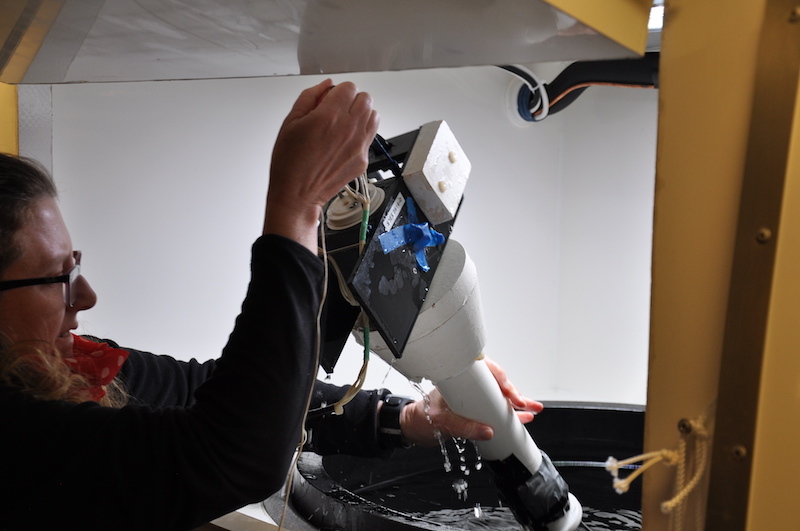 “The facility at Umeå Marine Sciences Center is one of a few in the world that gives us sufficient control of the water’s movements for our experiments. Independent temperature control in sections of the mesocosm, natural light sources and a freezer at the surface allows us to create a variety of different turbulent environments,” said Russell Arnott, researcher at the University of Bath. Laboratory techniques were used to analyze growth rates and primary production, while a suite of CTD sondes were employed for vertical profiling of various parameters. The movements of the water were monitored both with an Acoustic Doppler Velocimeter (ADV), and a SCAMP that measures salinity and temperature at every millimeter. During the 11 days of the experiment, large amounts of data have been collected, which is now being analyzed. “Our first impression, however, is that we can see clear signs that imply that some species gain a clear competitive advantage from different levels of turbulence in the water,” said Russell Arnott. Members of the research team: Danielle Wain (PI), Russell Arnott and Emily Slavin from University of Bath, Anastasia Tsotskou, University of Crete, with support from Mehdi Cherif, Umeå University. The SCAMP-instrument used is one of three that is still in working condition in Europe. The project is led by Danielle Wain (PI), University of Bath. Russell Arnott monitoring the water with a CTD. The experiment is part of Russell’s PhD. 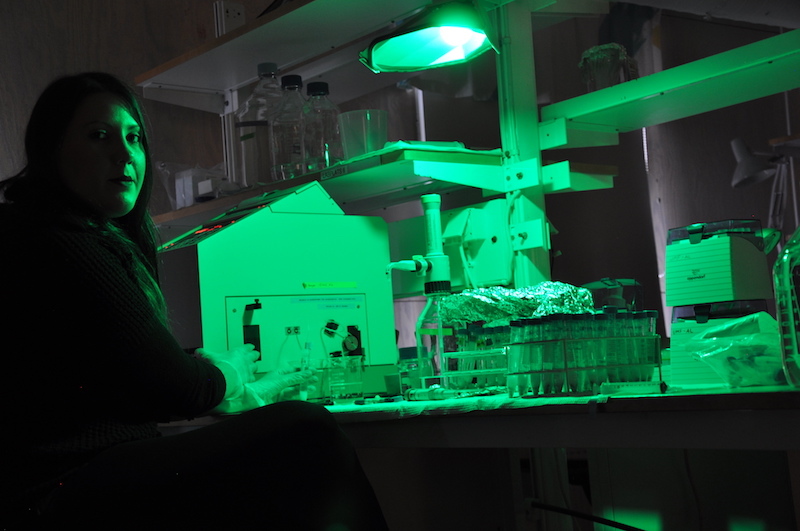 Anastasia Tsotskou from the University of Crete, working with the lights dimmed as organisms with chlorophyll otherwise might react on the light.